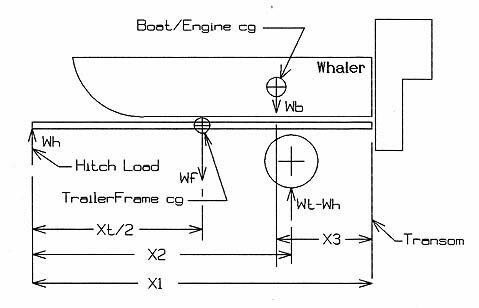 This article presents an engineer's analysis of boat trailer weight distribution performed by Jerry Townsend, a fellow Boston Whaler owner who is a mechanical engineer (M.S.M.E) with considerable experience in modeling of tractor-trailer dynamics. The original motivation for this analysis was a question posed in the Whaler FORUM by John Flook, who was doing some work on his trailer and wanted to know how to predict the tongue weight that would result from movement of the boat or axle position on the trailer. (You can also read the original message thread, Trailer Geometry 101.) Jerry responded with an excellent analysis of the weights and forces involved, and he has since expanded his comments and provided some sketches to supplement his explanations so that they might be more easily understood. The result is the article that appears below. In addition to solving the tongue weight problem, Professor Townsend also explains a boat weight calculation technique (that had appeared elsewhere but without any derivation of its method) that allows boat weight to be deduced from successive measurements of tongue weight with the boat in different positions on the trailer. Jerry Townsend was kind enough to write this material and create the illustrations. Jim Hebert converted them into the HTML presentation you see now. Proper balancing of the loads of your trailer is important to maintain dynamic stability of the vehicle-trailer system. To maintain dynamic stability requires, in part, a recommended hitch load of 5-percent to 10-percent of the towed load. The medium of this range, or 7.5-percent, is considered the target hitch load for our purposes. Changing your boat/trailer load balance can be done experimentally ( i.e., by trial and error) or can be accurately pre-calculated using the method shown below which will result on only a single movement to obtain the desired results. To understand the forces involved refer to Figure 1 below, which shows the loads of the boat and trailer. The weight of the boat, Wb, is understood to include the weight of the boat, engine, fuel (calculated at about one-half to two-thirds of the fuel capacity) and typical items (such as tools, cooler, etc.) carried in the boat. After changing your load balance, the center of gravity of the [boat + engine + fuel] will generally be just slightly (perhaps 1-6 inches) in front of the center of the axle(s). Unfortunately when we begin, we normally don't know the location of the center of gravity of the boat + engine + fuel + etc. In either case, firmly block (using cinder blocks, 4x4's or equivalent equal) the front and back of the wheels on both sides of the trailer to prevent it from moving. Setting up the boat/trailer balance experimentally is relatively simple and requires knowing the total weight of your [boat + engine + trailer]and the target hitch load (i.e., about 7.5-percent of the total towed weight). The basic process is to adjust the boat position on the trailer or the location of the axle(s) to give the target hitch load. The weight measuring capacity of a small scale can be extended using the lever principle. Moving the boat position relative to the trailer can be accomplished by using a come-along (either cable or chain) and other chain/cable/rope as necessary. Do not use nylon rope because, as we all know, nylon rope stretches! In fact, this job is worth purchasing enough plastic encapsulated 3/16" cable and a couple of cable clamps for the task. You may only need to move the boat an inch or two, so having control of the relative movements is required. Trying to pull the boat with another vehicle will not work. However, a vehicle with its wheels blocked may be used as an anchor for the come-along. move the winch standard and boat stop forward to provide at least the desired movement of the boat and then re-tightening the mounting bolts. move the boat forward via the boat winch which may be able to move the boat forward, particularly if the trailer incorporates keel rollers. Should the winch not be sufficient, then use another anchor (tree or vehicle with blocked wheels) as the reference for the come-along. until the desired target hitch load is achieved. Position the winch standard and boat stop and tighten all bolts. connect the come-along to a reference (tree or vehicle with blocked wheels) and connect to the transom anchors. Again, should the trailer incorporate keel rollers, the force required to move the boat can be relatively small. until the desired target hitch load is achieved. Reposition the winch standard and boat stop and tighten all mounting bolts. In the event that you plan on moving the axle(s), consider removing the axle(s), supporting the boat and trailer on jack- stands or automobile frame stands--good solid stuff. Forget the make-do blocking and bumper jacks! The jack-stands make the adjustment process easy because you are able to lower the trailer sufficiently to contact blocking of the trailer frame (rearward from the jack-stands but as close to them as possible so as not to increase the tongue loading excessively). Then move the jack-stands to the desired position, raise the boat/trailer off the frame/transom blocking and determine the hitch loading. Of course, the jack-stands on each trailer rail must be positioned similarly--the same distance from the hitch. Assume your hitch load needs to be adjusted. How far you would have to move the axle(s) to give the target hitch load? Also assume that a certified scale can be used to determine the weight on the hitch and the weight on the wheels. With this information and the known (or calculated) weight of the [boat + engine + fuel +accessories], you can calculate the location of the center of gravity of the boat and the new position of the boat (or axle) to give the desired hitch load. Non-engineers don't have to worry so much about the derivation of the formulas; they can just make use of them. It is, however, interesting to see how these equations were derived, which shall be demonstrated below. A requisite for making the calculations is knowing the location of the center of gravity of the [boat + fuel + engine + accessories]; this itself requires testing and calculations. Wb= Weight of the boat + engine + fuel + other normally included items (ice cooler, tool box, etc. ), lbs. An interesting determination of the boat + engine + etc weight is presented below. Wt= Total weight of the boat (as defined above) and trailer, lbs. If possible, get to a certified scale and independently weigh the load on the tires and the total weight. And, of course, the hitch load is the difference between the total weight and the load on the wheels. If actual weights are not possible, calculate the total weight as close as possible. Remember, gasoline weighs 6.28 lbs/gal and diesel fuel weighs about 6.84 lbs/gal. X1= Distance from the transom to the hitch. X2= Distance from the hitch to the center of the axle(s). X3= Distance from the transom to the center of gravity of the boat. Xf= The length of the trailer frame. NOTE: All dimensions must be in the same units, inches, feet or whatever. Notice above that the weight of the trailer frame is identified separately. The reason for this distinction is the trailer frame is centered between the axles and the hitch and therefore is contributing to the hitch load while the wheels, hubs and axles of the trailer are centered at the center of the axle(s). The weight of the tires, wheels, hubs and axle(s) is accounted for as the measured weight on the axle(s). These parameters will be used via an engineering analysis in which we sum the moments (force times distance) about a given location, defining clockwise as positive. The summation of moments is zero about any pivot point such as the axle(s) or about any free end of a structure such as at the hitch or transom. Note, however that if we sum moments about a point where a force acts, the moment from that force will be zero because the distance of that force to that point is zero. That is, if we sum moments about the hitch, the hitch load is negated in moment formulations. Whereas, if we sum moments about the transom, the hitch load contributes to the moment formulation. where the hitch load, Wh, is now the desired hitch load, and the total weight, Wt, is the same as the initial total weight, namely, the initial hitch load plus the initial wheel load. X3= Distance from the transom to the center of gravity of the boat. As calculated below. This is a reasonable number for this example. Therefore, in this example, you would want to move the axle back from 17 feet to 18.1 feet from the hitch. Notice the location of the center of gravity of the boat is 3.4 feet from the transom or 17.6 feet (21 - 3.4) from the hitch. Therefore, the center gravity of the boat is about 6 inches (18.1 ft - 17.6 ft) in front of the center of the axle(s). Then the center of gravity of the boat + engine + etc. would then be at 16.8 feet (19.8 - 3.4) from the hitch and then about 2.4 inches (17 ft - 16.8 ft) in front of the axle. To facilitate making all calculations, a DOS executable computer program is available. The program contains instructions for its use. Dan Taurone of Metuchen, New Jersey, brought to the attention of the continuousWave FORUM, a technique he noted on the world wide web to weigh a boat + engine + fuel + etc. using a bathroom scale. The method is technically correct as shown below, however the result may not be accurate as there is the potential of amplified errors. Use the method as desired, but be aware of the limitations. Solving for the common terms Wf(X2-Xf/2) in both (5a) and (6a). Wb= Weight of boat + engine + fuel + etc. the error is then amplified many (50 to 200) times by multiplying by the factor X2/Y. Further, a potential safety or damage concern arises because when displacing the boat, it is possible that the boat center of gravity could be moved rearward of the axle(s) and the boat and trailer would then tip, sending the tongue high. This article first appeared March 24, 2002.